Helping people with disabilities in your community is easy, fun and makes a big difference! What’s the key to FODAC’s decades of success? Volunteers! For every dollar FODAC receives, we give away over $10 worth of medical equipment. We are only able to do this with the support of our volunteers. Volunteers allow us to lower the overhead costs of our operations by donating their time and energy. From sorting donated items at our thrift store to learning how to repair wheelchairs, there are countless ways volunteers add value to our organization. We welcome volunteers to assist us Monday through Friday, from the hours of 9AM to 5PM. Community groups can schedule work projects on Saturdays by appointment. Here is a short list of areas where FODAC needs volunteers..
General mechanical and or electrical skills. Volunteers are needed to clean and repair wheelchairs, both manual and electric. 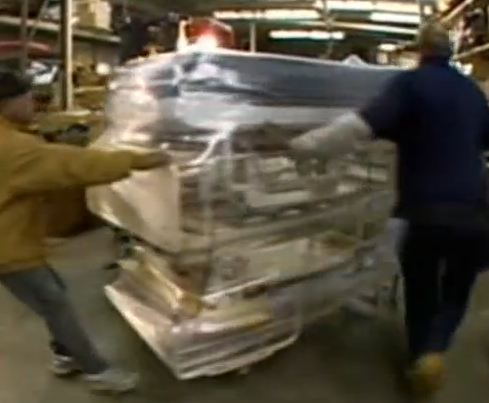 Also general assistance is needed in the warehouse; duties include the assembly of hospital beds. Clerical duties: Volunteers are needed for data entry for client information and financial information, as well as for light telephone work calling clients to schedule appointments for equipment pick-up and delivery. Volunteers are also needed for general reception duties, such as manning the reception desk and answering incoming phone calls..
Equipment pick-ups: Volunteers are needed to assist with picking up new and used medical equipment in the community for repair and distribution. Ramp building: Groups or individuals are needed to help build access ramps in homes in the Atlanta area. Computer technical skills: General computer repair skills are needed to test and repair donated computer equipment. Thrift Shop: Friends of Disabled Adults and Children operates a thrift store at its facility in Stone Mountain on Lewis Road. Volunteers are needed to assist with the various aspects of store operations including pricing, sorting, baling, minor assembly and testing electronics. Volunteers are needed during regular hours Monday-Friday from 10 a.m. to 4 p.m. and on Saturdays from 10 a.m. to 4 p.m.
Building maintenance and beautification: FODAC owns a 65,000 sq. ft. building in Stone Mountain. Volunteers are needed to assist with most aspects of maintenance and repairs from plumbing to painting to yard work.